The Dim Sum Diaries | Il Milione | "One cannot think well, love well, sleep well, if one has not dined well." Despite there being Italian restaurants practically on every street corner, the opening of a new one will always excite me. Needless to say that the first whispers I heard of brand new Il Milione Bar & Ristorante had me impatiently waiting to put it to the test. Il Milione, named after Marco Polo’s travelogue, exudes elegance the moment you walk in. 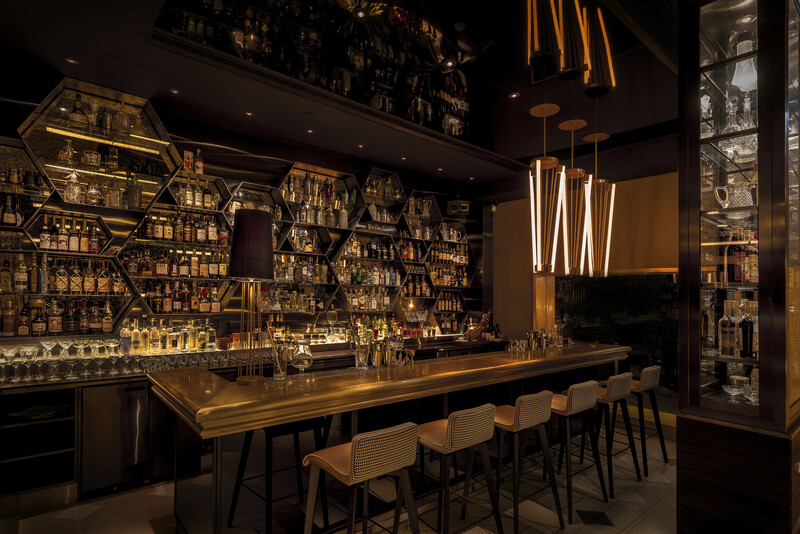 The first thing you see is its grand vintage-style bar stacked high with an insane selection of spirits. The bar, which is manned by “Bar Maestro” Giancarlo Mancino (formerly at Otto e Mezzo), serves a vast selection of drinks from its 13th century style ‘giornale’, or newspaper menu. 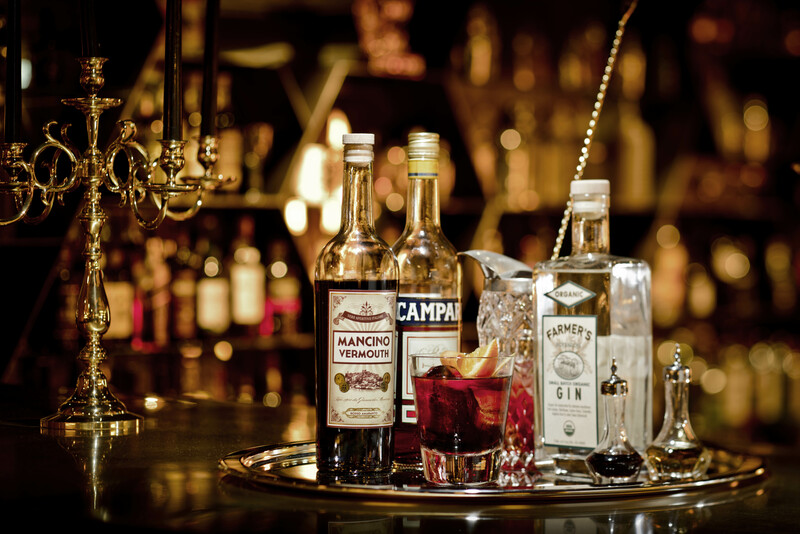 Giancarlo has his own brand of vermouth, Mancino Vermouth, which he uses to prepare his signature negronis. Only one litre of the secret recipe house negroni is prepared each night, so when it’s gone, it’s gone! Whilst a regular negroni is a little too strong for me, the ‘washed negroni’, made with elderflower and pink grapefruit zest was a refreshing start to a great evening. If negronis really aren’t for you, the apple martinis are amongst the best I’ve ever tasted. The bar does not stop at delicious drinks, however; every evening between 6.30 and 8.30, Il Milione serves traditional Italian aperitivi to snack on whilst you sip your drinks. 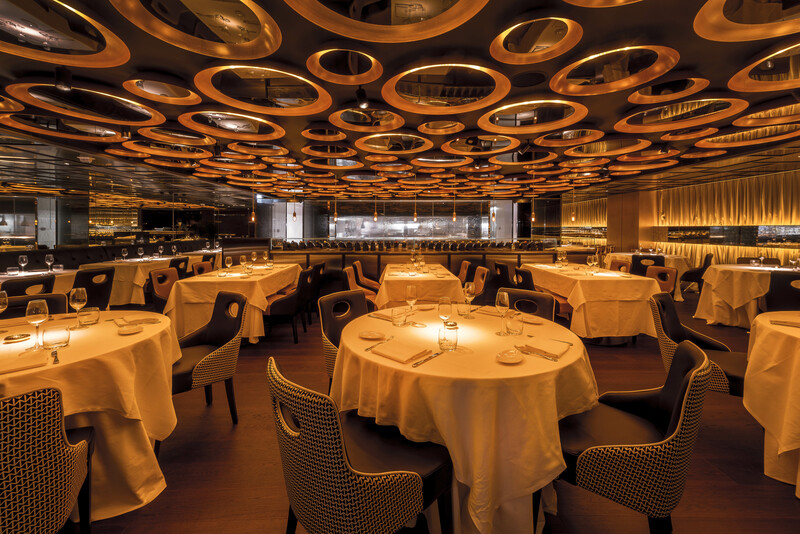 Moving further into the restaurant is a casual lounge area, followed by a glitzy dining room, which again instantly radiates elegance and class, where crisp white tablecloths are set against a dark ceiling lined with gold circular mirrors. 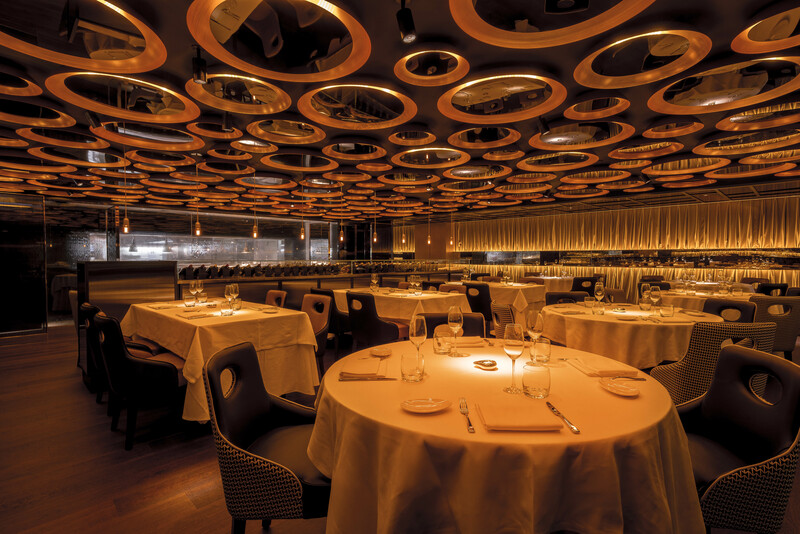 What truly stands Il Milione apart from any other Italian restaurant around town is its focus on Umbrian cuisine, led by Michelin-starred Umbrian chef Marco Gubbiotti. 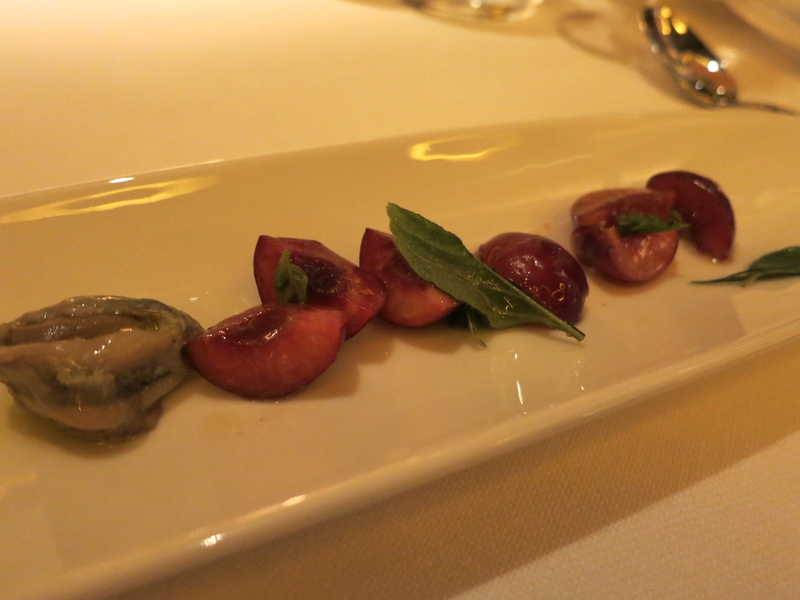 The amuse bouche of young cherries with chicken liver pate and anchovies was an indication of the level of quality we could expect for the rest of the meal. The flavours were bold and fresh, leaving us in eager anticipation of what was to come. 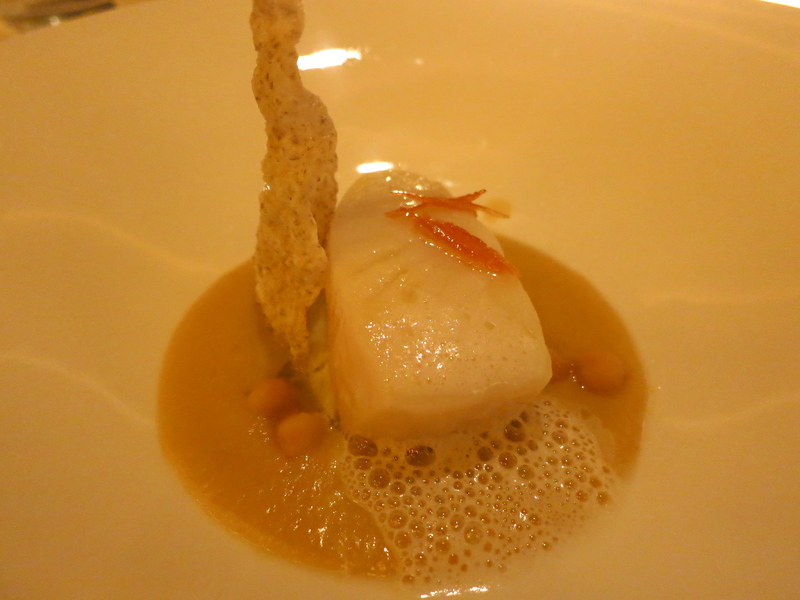 The meal proper began with ‘Baccalà su Baccalà’, or ‘cod on cod’. Given Umbria’s landlocked location, cod was apparently one of the only seafood items that could be preserved for transportation. Here it is cooked three ways: poached cod filet, crispy cod skin and creamed cod, served with Umbrian chickpeas and candied orange – delicate yet delicious. 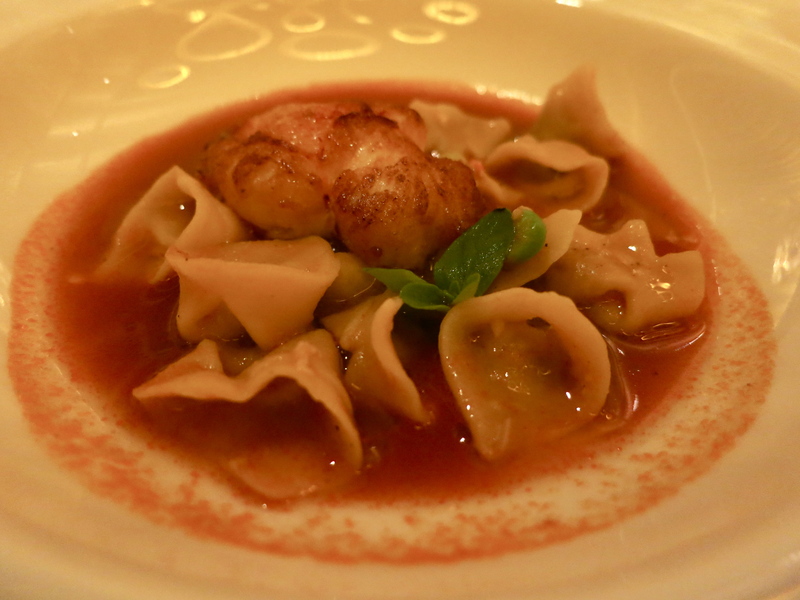 Following this came lobster tail in lobster soup with homemade cappelletti pasta and green peas. The lobster had a good bite to it and paired perfectly with the delicate parcels of chicken, pork, beef and prosciutto. For me, the green peas were a little undercooked and seemed out of place here, although they did add a touch of freshness to the dish. The pan-fried pigeon breast that followed was utterly divine, served on an open ravioli of minced pigeon laced with typically Umbrian spices. 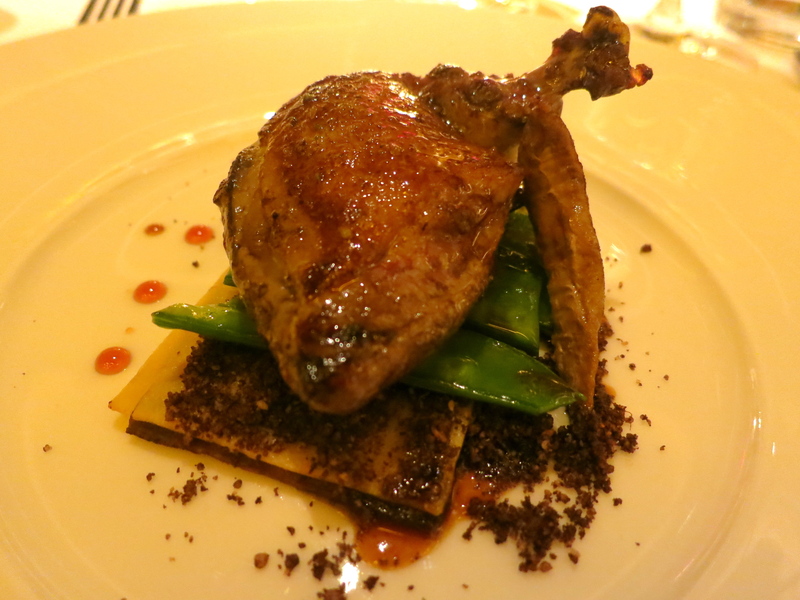 The lingering notes of cocoa powder, cinnamon and honey gave this dish a deliciously sweet versus savoury contrast. To cleanse the palate, we were served a carrot, orange and celery soup with coconut ricotta and gianduja – a somewhat bizarre combination that did in fact come together perfectly and did exactly what it was designed to do. Although on paper, the lentil cannolo with pistachio mousse did not overly excite me, on plate and in mouth, it most certainly did. The crispy cannolo was made with crushed brown lentils, giving it an unusual texture compared to its classic counterpart. 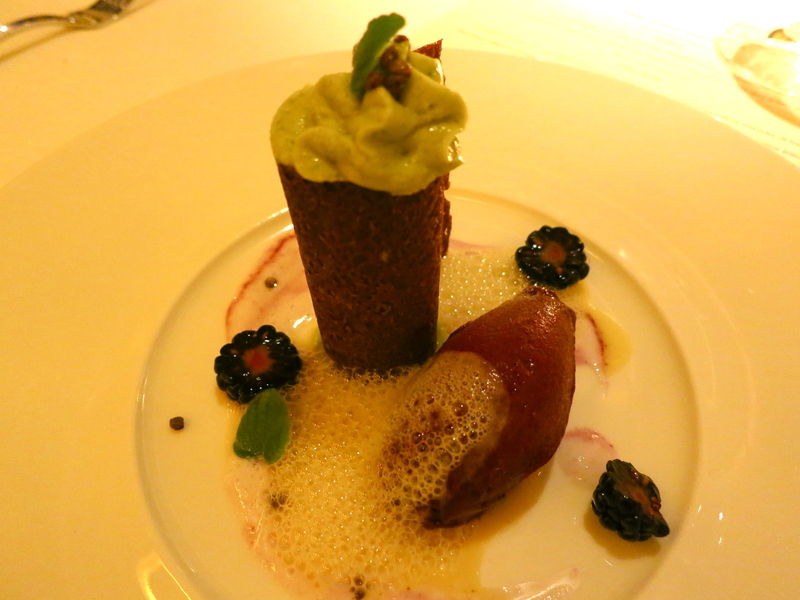 Instead of the usual ricotta with pistachios, the cannolo came stuffed with silky smooth pistachio mousse, which was neither too heavy nor too sweet and balanced nicely with the slightly sharp blackberry sorbet. This was all, of course, paired with some truly excellent Italian wines, which the restaurant’s passionate sommeliers picked out for us. Service is thankfully reflective of the overall standard of the restaurant, but this does also mean that you can be sure to expect to pay for the luxury, with starters from $200 and mains from around $300. A tasting menu, without drinks, will cost you $990. Bear in mind, however, that authentic, high quality ingredients are flown in from Umbria twice weekly and this might make the bill slightly less painful. Will I be back? Did I mention how good the apple martinis are, made the more so by free bar snacks? I enjoy your writing but you really need to work on your photos. The Canon S100 is certainly capable of doing much better than what you’re presenting here. If you could at least get the white balance right that would be a huge leap forward. Thanks for the comment. I do actually use a Canon S100! The lighting in that restaurant was not ideal and white plates in dull lighting are never great to shoot. Have a look at some other posts and you’ll see that generally the photos are a lot better. Yes, I know you’re shooting the S100, that’s why I mentioned it. The fact that the plates were white actually should have worked to your advantage, regardless of the available light there. You could have easily adjusted things when you were processing the photos back home, literally just two clicks with the mouse if you’re using any one of a dozen photo processing software packages, even free ones like Picasa. Invite me along to your next freebie, I’ll bring an S100 with me, we can compare results afterwards and then I can teach you how I did it?